We held our second ever event with Welsh League division 2 promotion side Caerau Ely FC. 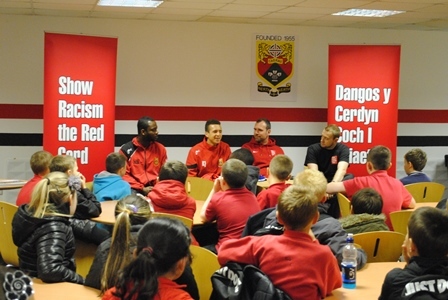 Young people from Pencaerau Primary School attended the stadium for the day to learn about racism. Education worker Aimee Jones and former professional player Steve Jenkins delivered a workshop to the young people who took part in interactive activities learning about what is racism and who can be effected by it. The pupils were engaged throughout the day in discussion based activities using role models across many sports to educate them about how racism can impact on people lives. After watching our educational DVD the pupils took part in a role play media conference at the club and had the opportunity to ask questions during the press conference about racism in football and society. Team manager Nana Baah and first team player Kieron Joseph joined Steve Jenkins on the panel to answer questions from the young people. Throughout the day pupils took the opportunity to take down notes to use in their articles which they will write when back at school after the event. The best asked questions won SRtRC goodie bags and the winner of the best written article will receive a prize form the club. We would like to thank the school for attending and the club for supporting the event. The event was sponsored by the FAW, The big Lottery and the Welsh Government.